This well known Artistic organization made a reputation under the management of Benson of Chicago and its tours created a sensation where ever an engagement was filled. 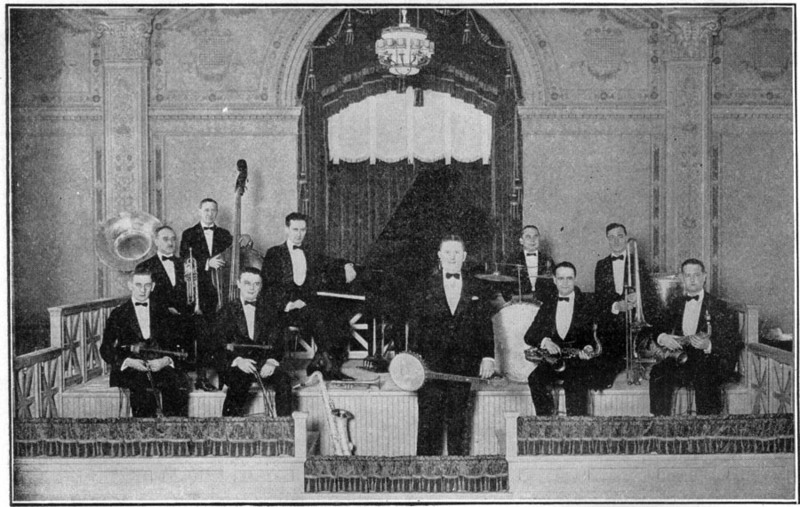 Mr. Williams and his orchestra has been playing in Omaha, Neb., for the past season and it was during this period that more Conn instruments were purchased until the entire orchestra was equipped with Conn Brass and Reeds. Following the Omaha engagement they were booked for California where they are meeting with their usual ovations. The members in the photo comprise Joe Gill—Violin, E. G. Kummen—Violin & Saxophone, W. T. Stewart— Bass and Tuba, William Krenz—Piano, Billie Richards—Sax & Clarinet, Dudley Doe-Saxophone, J. Darpa-Cornet, Ted Huber-Trombone, William Gilchen—Drums, Ralph Williams—Leader, Banjo and Cornet. "Our Conns are wonderful and you are entitled to highest praise for their perfection." 1. C. C. Conn Ltd. Musical Truth, Vol. XI, No. 30, Elkhart, Ind., May, 1922, page 20. Are you looking for WILLIAMS ancestors? If so, we suggest posting a query to our Community Message Board to get assistance from other researchers.